To celebrate the relaunch (pun intended) of a cutting-edge space travel program, a well-known client in the space travel industry quite literally wanted to host an out-of-this-world event to commemorate its progress, and that’s exactly what we delivered. Welcoming nearly 1,000 people to the evening’s festivities on a warm spring night in Waco, we transformed a mid-sized university’s sports club into another planet, closely resembling what we imagine life on Mars might be like. The result; an otherworldly corporate event unlike any other ever thrown. Transporting guests to a futuristic Martian landscape in an imagined reality where humans actually inhabit “The Red Planet,” we pulled out all the stops from a design and technology perspective, using light, sound, color and inventive art installations to convey a sense of otherworldliness and infinite possibility. As guests entered a cavernous, blackened space, each was greeted by a futuristic character who handed them a nitrogen cocktail and a Casio watch without explanation, beckoning them to put it on their wrist. Tunneled through an immersive fiber optic art installation hanging overhead and around them, guests were led into the main event space, where an ultramodern steel structure had been erected along with a large mesh banner of Mars itself, lit in red for added ambience. To help guests loosen up and ease into the evening, onsite diversions included a duo of open-air photobooths with holographic backdrops, space helmets, futuristic props and Boomerang shots emailed instantly to guests. A series of classic space-themed video games were also on hand for guests to play, including TRON, Galaga and Space Invaders. In the outdoor space, performers roamed the crowd twirling neon hula-hoops as a brass band in all-black suits and bold red eye makeup took to the bleachers performing alongside trained vocalists. Back inside, to complement the lounge seating throughout the space, we placed VR technology at each coffee table for guests to interact with. 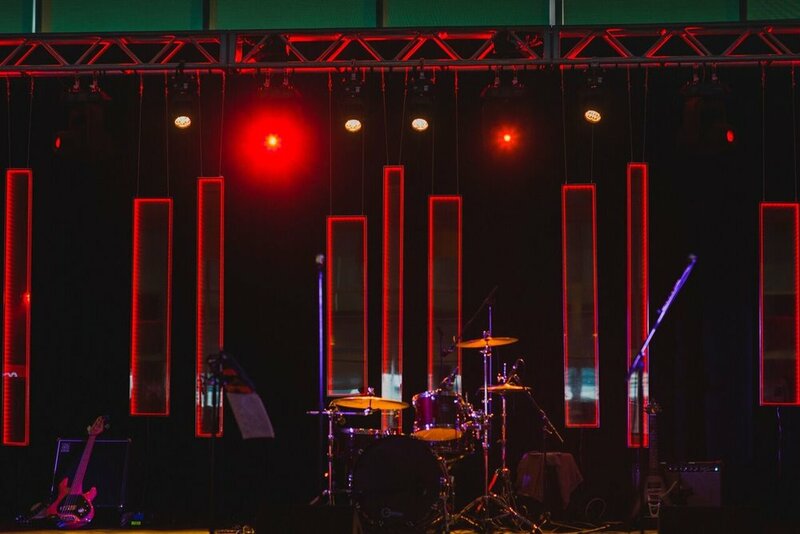 Onstage, a series of mirrored infinity panels were hung and lit up in red during the live band set, later adjusting themselves to a strobe setting as the DJ spun atmospheric music late into the night. The dance floor pulsed with red light, drawing guests to its center like moths to a flame as the mod-pop band The Spazmatics, known for their Talking Heads-esque aesthetic and retro 80s sound, rocked their set. As they left the stage afterward, the space fell purposefully quiet, setting the scene for an epic change in tone. On all the monitors and jumbotron, the custom video that had been on display all evening began to glitch as images of a digital clock face blinked on in its place. Next, an exercise in synchronicity: as the clock struck 10pm, the watch alarms on every guest’s arm went off simultaneously throughout the space. Slowly, the DJ began to meld the beeping sound into the opening strains of David Bowie’s iconic “Life on Mars.” The moment the music dropped, the entire cast of onsite characters, dancers and staff hit the floor to hand out LED glow sticks as the party shifted in tone. Above the crowd, aerial dancers performed on red trampolines and interacted with guests for the remainder of the evening as light sequencing and music elevated the experience to the next level until midnight struck and guests were finally brought back down to earth. Need a top-shelf partner to plan and produce your next big event? Touch base with us and let us help you count down to an event to remember.